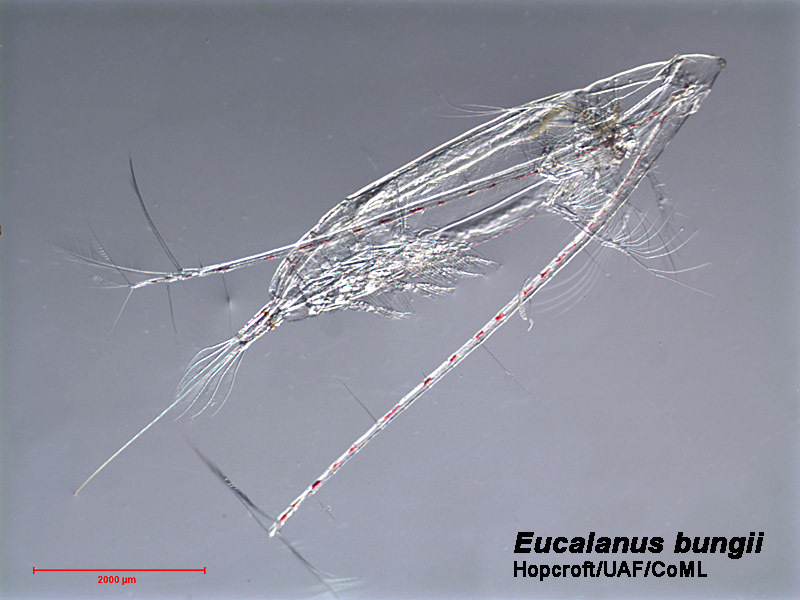 Time series can be generated for numerous zooplankton species along the Seward Line, but our focus thus far has been on the 15-18 species linked below that dominate the zooplankton, either in terms of abundance or biomass. We also watch for the presence of species normally associated with waters from outside the Gulf of Alaska that can be transported northward during summer in warm years. With 17 years of data in hand, we can fully appreciate when species have 'good' and 'bad' years in the Gulf of Alaska. While several species occur abundantly year round, some species such as Neocalanus are only captured by our sampling program during either spring or summer. Basic biology and ecology of species and be found under the zooplankton species pages. 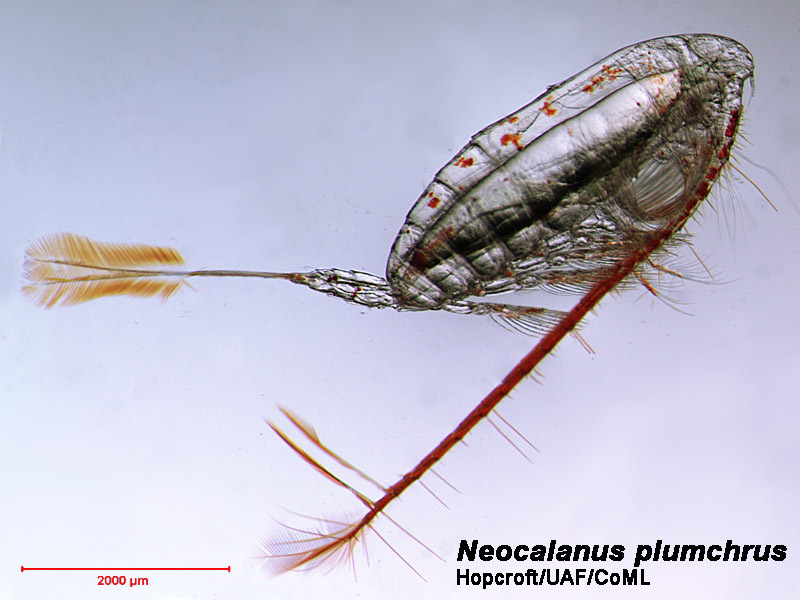 Zooplankton on the GOA shelf are a mixture of two major species complexes, composed of neritic and oceanic taxa. During May and early June, the oceanic complex, consisting primarily of Neocalanus flemingeri, Neocalanus plumchrus, Neocalanus cristatus, Metridia pacifica, and Eucalanus bungii, dominates the biomass. 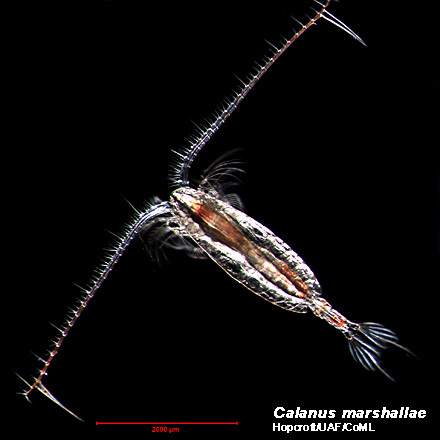 Abundances are dominated by smaller copepods, usually Pseudocalanus spp., and Oithona similis, with population peaks in July or August, sometimes supplemented by Acartia longiremis and/or Centropages abdominalis. These copepods are major vectors moving energy from primary producers to both middle and upper trophic levels (including fish). Conditions which enhance or depress these populations may thus impact the survival and year-class strength of fish stocks on the shelf. Organisms of secondary importance in terms of abundance and biomass include the euphausiids (Thysanoessa inermis, Thsanoessa spinifera and Euphausia pacifica), the pteropod Limacina helicina and larvaceans (Oikopleura spp.). 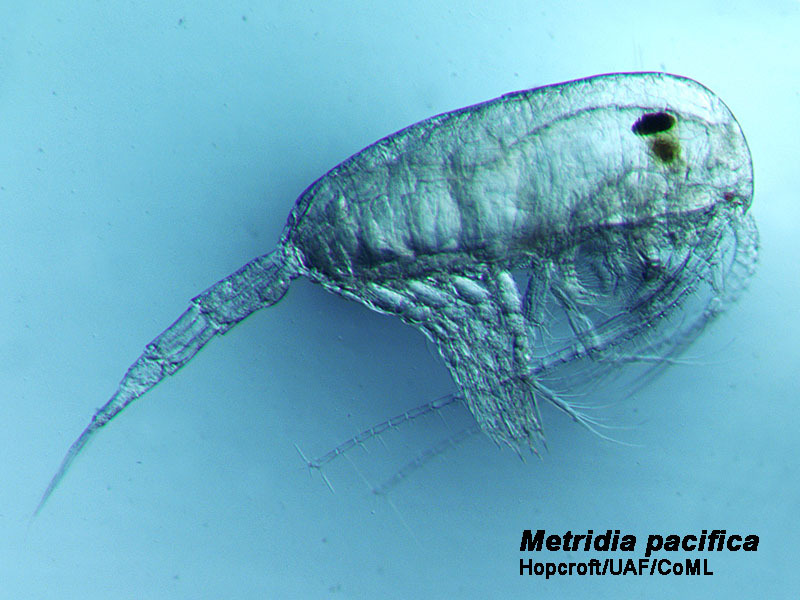 Dominant zooplankton predators are the chaetognath Parasagitta elegans, and the meduase Aglantha digitale. All of these taxa contribute to the diets of various fishes during their early life-histories or even as adults.